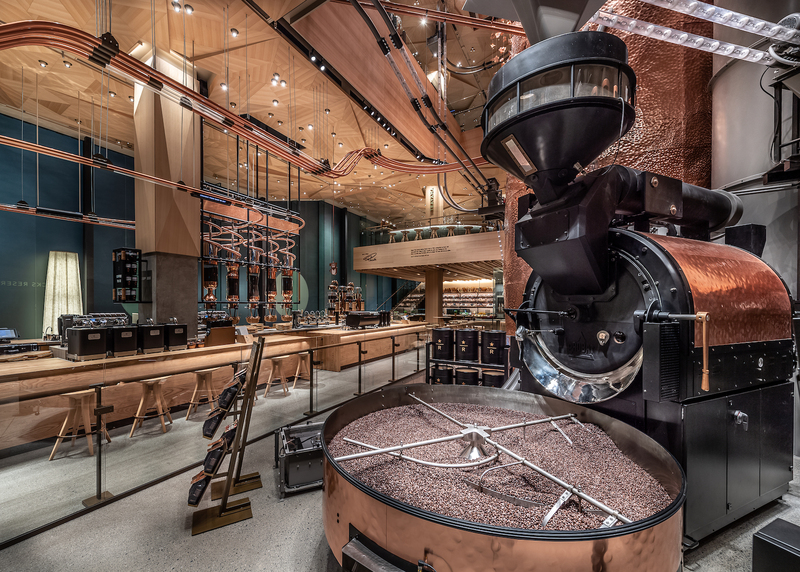 Starbucks on Thursday will open the Starbucks Reserve Roastery Tokyo, a four-story tribute to premium coffee quality, innovation and human connection. This will be the fifth Roastery globally, reaffirming the company's 23-year commitment to Japan. The Roastery introduces customers to more than 100 unique coffee and tea beverages and merchandise, as well as a menu of artisanal Princi Italian fare for the first time in Japan. It also celebrates the Japanese culture of connection and craftsmanship through the first AMU Inspiration Lounge - from the Japanese amu, meaning "knit together"- to host community gathering events and is planned to become Starbucks first Specialty Coffee Association certified training location in Japan. "As the first international market outside of North America, Starbucks Japan has contributed 23 years of innovation for the company globally," said Kevin Johnson, CEO, Starbucks Coffee Company. 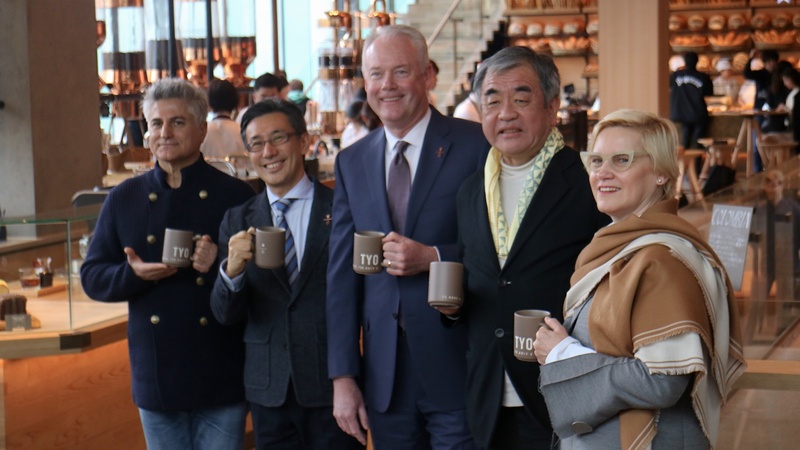 "The opening of the Tokyo Roastery will further amplify what Starbucks Japan has done across all stores in the market for more than two decades-innovating and delivering the finest quality coffee one person, one cup and one neighborhood at a time." 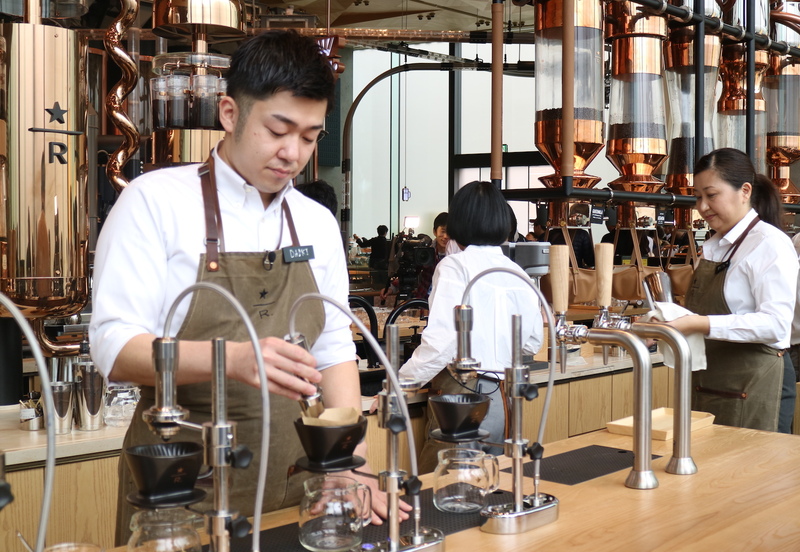 Takafumi Minaguchi, CEO, Starbucks Japan, added, "The Roastery will amplify and inspire coffee passion across all Starbucks stores, and will serve as a catalyst for a new wave of growth centered on the customer experience and passion for coffee and service. Beginning with the 'Make It Yours' campaign that will commence at every store in Japan upon the opening of the Roastery, customers will be invited to experience the first Starbucks coffee roasted exclusively in Tokyo, for Japan, and available in a variety of coffee beverage styles." 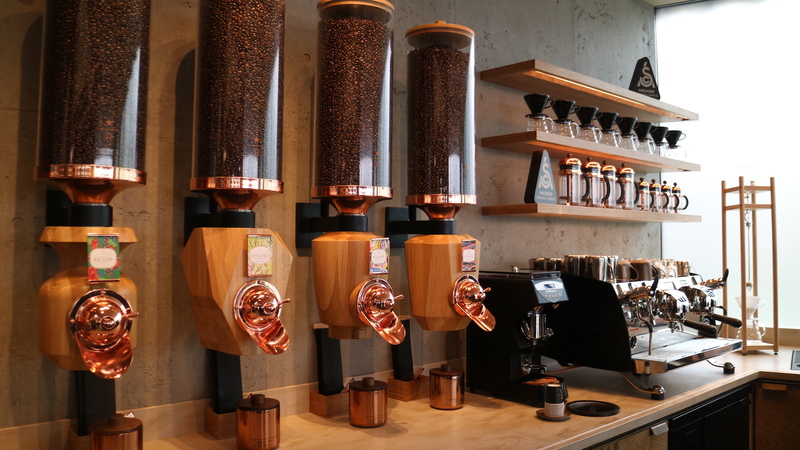 Located in Tokyo's vibrant and creative neighborhood of Nakameguro, the Roastery's enchanting design was inspired by the famous cherry blossom trees lining the Meguro River. The building's glass walls and terraced floors seamlessly fold into the fabric of the neighborhood, bringing visitors eye-level with the cherry blossoms and the four seasons of the river to reflect the natural beauty and sense of harmony found across Japan. 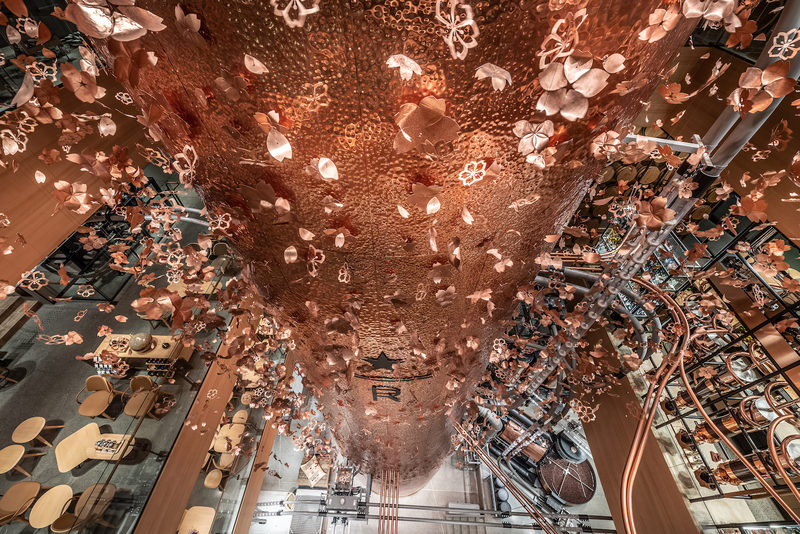 Upon entering the Roastery, customers are greeted by the world's largest Starbucks Roastery coffee cask, four-stories and over 55 feet of blush-tinted copper adorned with hand-crafted copper cherry blossoms, which changes hues throughout the day in different lights. The expansive cask was built using the technique of tsuchime, a tradition of copper beating, where each person involved in the building of the Roastery was offered the chance to hammer a portion to create its texture and pattern. The cask's unique color is balanced against the light wood which has been carried into the interior to give the store a brightness found throughout traditional Japanese architecture. 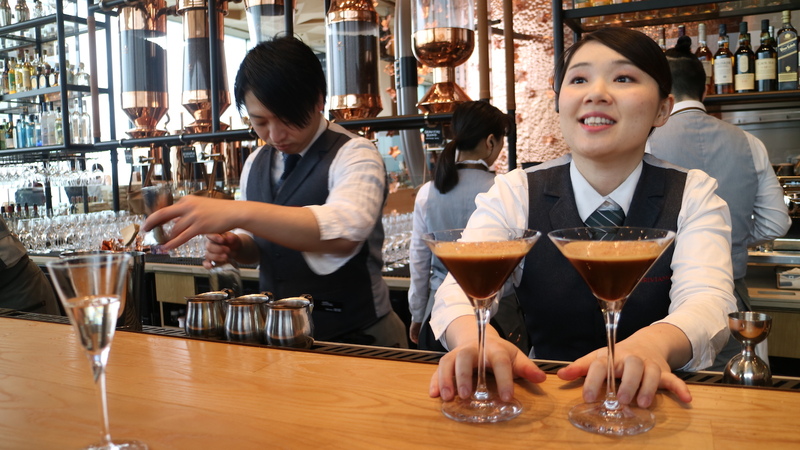 The coffee journey at the Reserve Roastery Tokyo is an immersive experience and education in coffee, and its process-from green bean to cup-which begins at the Main Bar on the first floor. 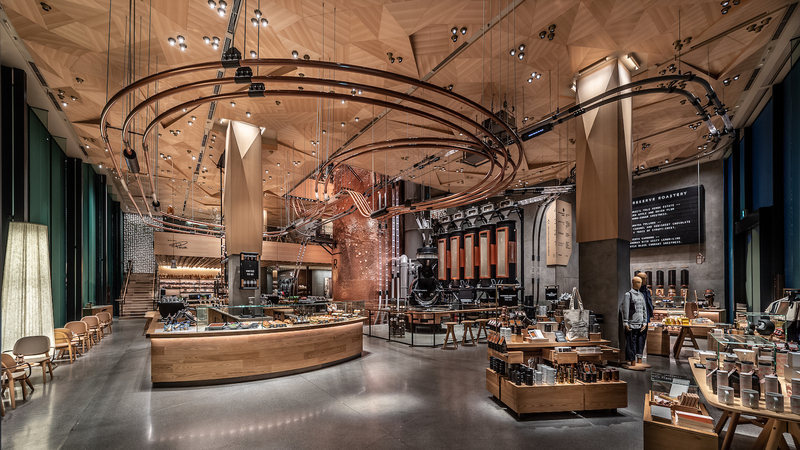 The open floor plan draws customers into the immersive experience, introducing them to the skilled art of roasting, brewing and hand-crafting beverages. The Reserve Roastery serves the freshest cup of coffee and it is here on the first floor that customers can taste Reserve coffee beverages such as Barrel-Aged Cold Brew. The Princi bakery serves handcrafted, authentic artisanal Italian fare that is baked fresh in the Roastery throughout the day. 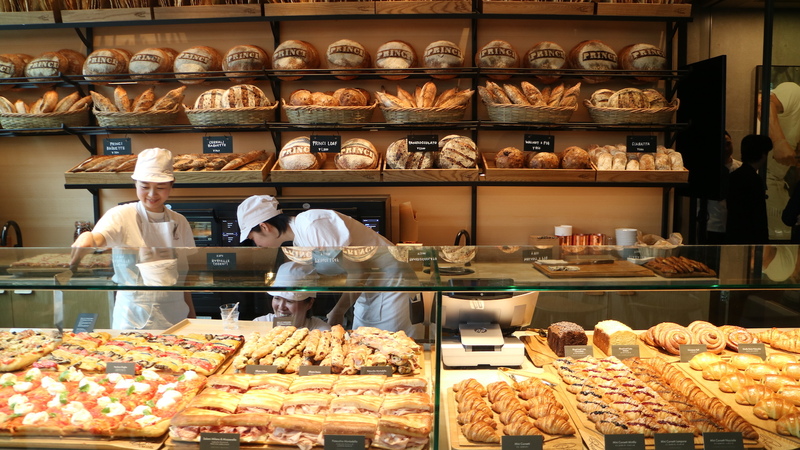 For the first time in Japan, customers can enjoy freshly-baked breads, cornetti, focaccias, pizzas, salads and more. 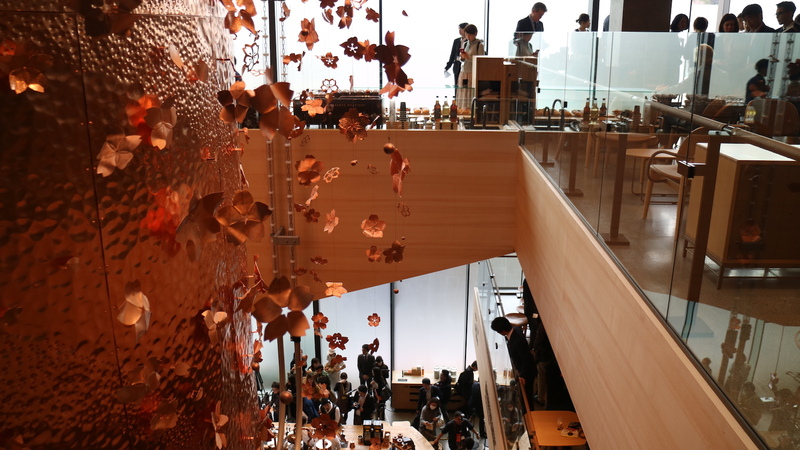 An airy staircase leads to the second floor, where customers will be transported into the tradition of Japanese tea at the world's largest Teavana Bar. Exclusive tea beverages, such as the Pop'n Tea Sakura Jasmine, featuring a vibrant hibiscus and cherry popsicle atop a floral jasmine tea, will delight customers with their charming appearance, Japanese ingredients and unique flavor combinations, modernizing the tea experience. On the terraced third floor, Starbucks Japan's first cocktail bar, ArriviamoT, puts innovation, mixology and cocktail craft on full display. 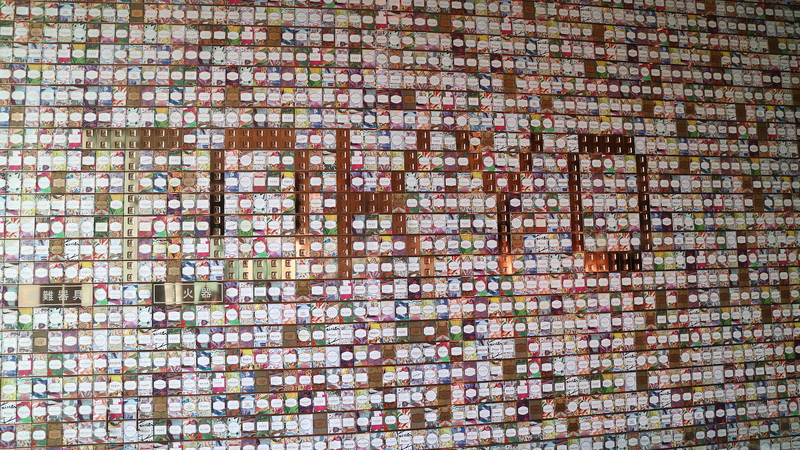 The two walls of spirits bring together the Arriviamo menu, featuring coffee and tea-inspired cocktails only available at the Tokyo Roastery, including the Nakameguro Espresso Martini made with chestnut liqueur, crème de cacao and espresso, then paired with decadent chocolate from Nakameguro's "green bean to bar CHOCOLATE" brand. Wine, beer and classic mixology beverages will also be available. The fourth floor of the Starbucks Reserve Roastery Tokyo is home to AMU Inspiration Lounge - a dedicated space for the community to gather for hosted social impact conversations. For the first time at any Starbucks location in the world, this intimate space will serve as a platform to host change-makers and creative thinkers from across Japan. The first event in April will celebrate the role of women leaders in Japan. The Roastery is planned to become Starbucks first certified Specialty Coffee Association (SCA) location offering training for coffee professionals in the near future. "We believe that where passions connect, the future is sparked, and we will offer the Tokyo Roastery as a gathering space to spark new ideas and create an impact," said Minaguchi. 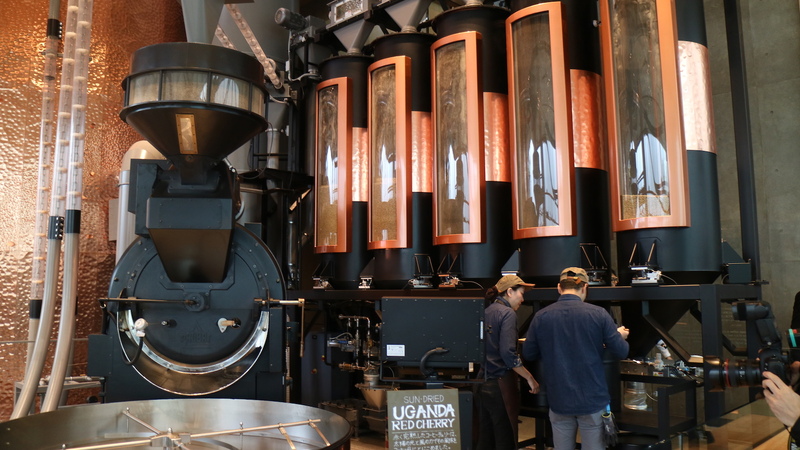 "The Roastery signifies our commitment to fostering moments of human connection over a cup of coffee and using these moments to create positive social impact in the communities we serve." With more than 37,000 partners who proudly wear the green apron across Japan's 47 prefectures and 250 at the Roastery itself, Starbucks Japan will amplify coffee craft and innovation by freshly roasting small-batch coffees from around the world every day in Tokyo and introducing new beverages, concepts and inspiration to all 1,400 stores across Japan. This amplification will begin with Tokyo Roast coffee, a Starbucks Japan-exclusive coffee, available throughout the market on opening day. This is state of the art Starbucks. What a fantastic design. Is it just me, but the top foto has an air of piety, a stated atmosphere of reverence. The angle of the shot, the gabled roof line, and the almost crucifix-like roof adornment atopped with a star. The Cathedral of Coffee. Worshippers of the Roast gather. Looks fabulous! Starbucks is like a Lexus when it comes to coffee, the Best! My dream is to visit the Roastery for a Starbucks Martini! Patricia: You missed where it said Nakameguro. No thanks. Everything is overpriced at Starbucks. This is also accessible one station from Shibuya via Ikejiri Ohashi on the Denentoshi line. Tempting to visit the place since it looks nice, but I refuse to give my money to Starbucks on principle. The last the thing the world needs is more US giant chain shops, and politicially correct California elites who tell us how to think. I think Starbucks are great if they serve milk as do UCC Cafe in Osaka. Seattle Coffee in Hakata only offer crema fake milk and refused to provide milk with my ordered coffee, stating that it was too expensive - obviously some coffee franchises in Japan have absolutely no idea what coffee is all about.